Tribute: Andre the Giant - WrestleCrap - The Very Worst of Pro Wrestling! I remember being scared of Andre as a child. In the summer of 1989, my Ninja Turtles and Legos, my Batman and my Double Dare, they all would get back-burnered in favor of something my brother Josh dragged me into. I wasn’t kicking and screaming when I got my first taste of World Wrestling Federation action, nor was I willing to leave it at just a taste. Instead, I was enraptured by the characters. Before long, The Joker, Shredder, and Marc “Still Not Clean” Summers had taken a backseat to Macho Man Randy Savage, The Ultimate Warrior, and Demolition. Who needs the Sundae Slide when you have a blue-barred steel cage? But like most five-year-olds, I also had my share of fears. I was scared Vigo the Carpathian was going to step out of the silver screen and attack me in my sleep, for one. A more common fear I shared with my age group was getting caught eating candy too close to dinnertime. 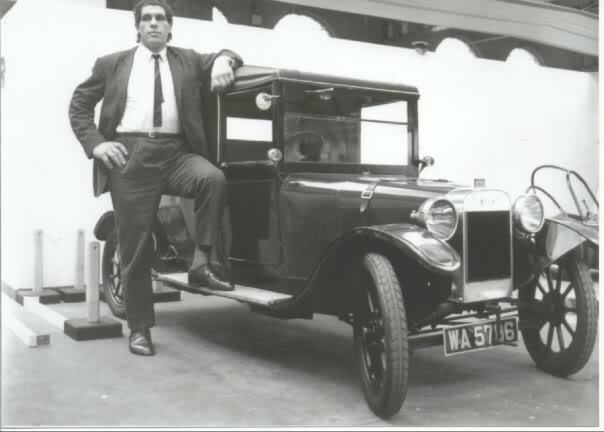 Oh, and I mustn’t forget my fear of Andre the Giant. Towering around seven feet of height, lumbering his girthy 500 pounds of mass towards his next undersized victim, I dreaded what he could do to my heroes. Especially after he manhandled the Ultimate Warrior with a chokehold, one that my face-painted hero could not liberate himself from. And I thought the Warrior could overpower anything and anyone. My worst moment as a fan of that age? When Andre and Haku destroyed my favorite tag team of Ax and Smash to become WWF Tag Team Champions, after Andre javelined his elbow onto Ax’s prone body. I went Christmas tree shopping with my folks right after, and you’d never seen a ghostlier-white kid outside of Bob Backlund’s photo album. It wasn’t until my dad rented us a copy of WrestleMania III that I felt a little better, knowing that Andre was mortal enough to be felled by Hulk Hogan. I’d never seen Andre pinned before, and with that knowledge came peace of mind. The Ghostbusters stopped Vigo, and now I knew Andre could be stopped too. It was the day before Super Bowl XXVII that I found out Andre had died. My parents had the evening news on, and the anchor had revealed that “world famous wrestler” Andre the Giant had passed away days earlier. 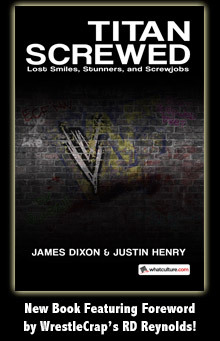 It was the first wrestling death I’d become intimately familiar with since becoming a fan, and it’s the first one I think of whenever I list off the scroll of wrestling’s fallen brotherhood. Andre was 46, felled by a heart attack while home to attend his own father’s funeral. The very man who I’d feared just three years earlier had left this earth, a victim of physical irony: enlarged body, truncated life. No other wrestler since has unnerved me as he had with his wide eyes, garbled speak, muttonchops bigger than my torso, and hands that could palm a park bench. The Undertaker, even with his caskets, bodybags, and imperviousness to pain, hadn’t the effect on me that “The Eighth Wonder of the World” did. I’ve sometimes wondered what fear other wrestlers have instilled upon later fans. Kane, with his ability to shoot fireballs at innocent bystanders, didn’t scare me at age 14, but what about younger fans? When The Great Khali was manhandling Undertaker with effortless ease seven years ago, were there any 5-year-olds out there that feared The Punjabi Giant? Andre has two things that cement his long-lasting legacy: he never became a punchline (excepting his painfully awkward wrestling in later years, due to his deteriorating body), and he’s one of few wrestlers who’ve taken on a mythic, Paul Bunyan-like collected biography from his peers. Not to say Andre had many peers. Some have been as large as he, like Kane, Khali, and Big Show, and they’ve done their part to continue his set prototype of dominant monster presentation. But Andre was never purported to have violated a dead cheerleader, nor did he ever have to attend anger management therapy with Bob Orton. He never adopted a midget sidekick and donned a Long Island party boy’s attire in an act of solidarity. He would also never allow someone like The Rock to make the jokes about him that Rock made about Big Show. Andre would have crushed The People’s Windpipe with his waffle-iron set of hands. Watching old matches with Andre against Hogan or Savage, it’s neat to watch these supposed legends, the best of the best, the invincible heroes, strike Andre, see their punch have no effect, and swivel their heads to the audience, bug-eyed and astonished. A Hulk Hogan punch could drop most people, but Andre isn’t most people. No matter how big a star you were, in televised matches, nobody, not even Hogan, one-upped Andre so easily. Meanwhile, Big Show’s been pinned by Zach Gowen and Shane McMahon. As far as the mythos of the Giant, you’ve heard many of the campfire tales, I’m sure. What is it, 116 beers in a sitting? Turned over a car with 4 men in it after a traffic altercation? Threatened to overturn the WrestleMania III ring cart with Hogan in it, so Hogan chose to walk to the ring instead? Oh, he has a posse, you know. They said you could push a hard-boiled egg through any ring he wore. He drank $40,000 worth of alcohol on the set of Princess Bride. Hogan feared him. He beat the crap out of Chuck Wepner. They had to consult NASA to have special tools built for his 1986 back surgery. Hell, the doctors were worried about what dosage of anesthesia to give him. Too little, and he’d wake up while wide-incised. Too much would kill any normal man. To the doctors, Andre was no ordinary patient, just as he was no ordinary man to anyone who’s seen him. By the time Andre died on January 27, 1993, twenty years ago today, my fears of him had subsided. Now I see him as one of the most awesome figures in wrestling lore, and I can’t help but smile whenever I come across anything Andre related, from his squash matches, to his threateningly-concise promos, to his gentle giant demeanor on talk shows, to those old-wives’-tales of his virility, and the abidance of his liver. There has never been another wrestler worthy of his throne of “wrestling’s true giant”, and that’s how it will remain until the endtimes. 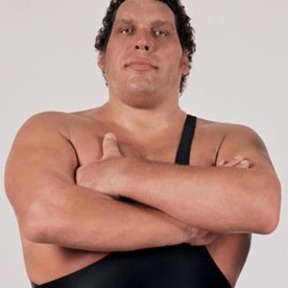 The legend of Andre the Giant has endured the ravages of time, and it will continue to, long after those who first propagated that legend leave this world behind. And if I ever meet him in the beyond, hopefully I’m not too scared to say hello. 11 Responses to "Tribute: Andre the Giant"
That was wonderful. My girlfriend isn’t too much of a wrestling fan. She tries to sound like she cares, but really doesn’t, but ever since she watched the Princess Bride with me, she fell in love with Andre, and actually gives me something to work with when wrestling is a conversation piece on my mind. The one match she actually liked most was Hogan/Andre at WrestleMania III. Representative of Andre’s fear/respect he had with wrestling fans: he gets a gushing tribute on a site dedicated to The Worst Of Wrestling. R.I.P. you terrifying individual. I, too, was scared of Andre when I was little, until I had seen The Princess Bride not long after it came out to VHS. It was then that I’d learned how funny and gentle he really could be. From that point on, Andre would always be one of my favorites. That said, beautifully written piece, Justin. 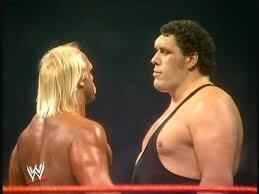 That pic of Hogan and Andre always reminds me of how big Hogan himself was. He’s damn near eye-to-eye with Andre right there. Andre was a truly unique individual, and was truly one of the wrestlers that EVERYBODY knows, even today. Kids may not know Hogan now, but chances are they’ve seen The Princess Bride at least and know who Andre is. Another home run, Justin! Very well done. That was very touching, Justin. Just Imagine how big his dong was? ive had the pleazure of meeting a lot of wrestlerz in my life. some i didnt get the chance to becuz either i never got to see em at a show or an autograph session. other timez it waz becuz theyd passed on before the chance happened. but Andre wouldve been one id loved to have met gotten a pic with n framed it for good. many are missed but few are remembered az much az Andre. I actually started watching WWF three weeks before Wrestlemania VII, so Andre had already made his final face turn by that time. I was never really afraid of him, but he WAS awe-inspiring. Undertaker scared the crap out of me, though. I was 9.